It has become accepted wisdom that the male of the species needs a space of his own to escape the pressures of family life. Be it the shed, the garage or the attic, the man cave is said to help them de-stress, regulate emotions and become less grumpy in general. Men with 2.5 children have long indulged in this luxury, so father-of-11 Eric McAvoy felt he was entitled to some me-time. Up in the attic of his Salford home, he indulged his passion for home brewing and, in time, his seven sons and four daughters began helping with his experimental beers. When each turned 18, their first legal drink was a pint of Eric’s 4% abv beer. Fast-forward to 2018 and the brothers now have a thriving craft beer business, so it clearly rubbed off on them. The oldest, Guy, looks after special projects and the youngest, Greg, is the head brewer, while Keith runs the commercial side of the business along with Kit. Nathan manages production, Luke is in charge of IT and Danny handles operations. 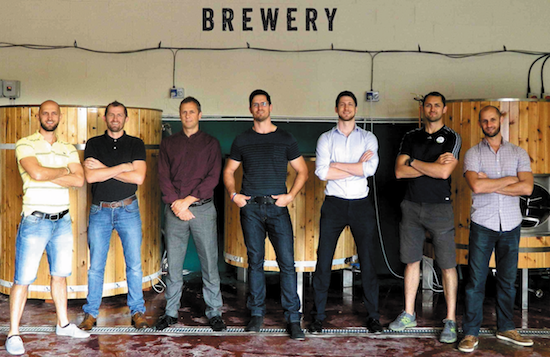 Seven Brothers Brewery produces a range of beers including an IPA, a stout and a session ale, and is now looking to break out of its Manchester heartland after gaining investment through crowdfunding and increasing capacity. Sibling rivalry is bound to be an issue in a house with so many offspring, and the four women are in no way content to let their brothers have all the fun. After watching from the sidelines for four years as the brewery took off, Kerry, Hayley, Kate and Lucy have now launched Four Sisters Distillery and released their first gin. We caught up with Lucy and Keith to discuss the McAvoy family’s quest to arm the nation with great beer and gin – two of the most thriving categories in the industry at present. It is early days for the gin, but the brothers’ beer range has already built up a strong on-trade following and secured a listing with the Co-op and various north west retailers. They have brought in Keith Webb, former managing director at Bargain Booze, to help grow the business. Webb, one of the three execs that floated the business in 2013, says he was responsible for the name Conviviality and he still has the beer mat he wrote it down on. He feels there is an opportunity for Seven Brothers and Four Sisters to break into the convenience market. “By and large craft products will be lower volume but higher cash and percentage margin, so they are well worth a try,” he says. “I would recommend a core of craft products complemented by a rolling programme of new additions. Understandably, there has been a huge push on the concept of localness as a buttress against the price deflation and margin pressures. “The challenge for any retailer is to hit the sweet spot of space and SKU allocation for the locality the shop is in. That needs trial and close monitoring. The Seven Brothers range has a core of seven SKUs and is now being complemented by a rolling programme of collaborations and seasonal releases, the latest being the Imperial Salted Butter Caramel Milk Stout at 8% abv. “There is, of course, a plethora of gins and choosing the right range is going to be an individual choice for retailers. “While there is clearly a place for the place specific brands such as Liverpool and Manchester gins, that may be self-limiting in terms of appeal when too far away from those places. The four sisters and seven brothers are confident that their gin and beer delivers on quality, and Eric would probably raise a glass of 4% abv beer from his man cave to that.